BEIJING, May 16 (Xinhua) -- Chinese President Xi Jinping on Tuesday called for deepening cooperation with Laos and creating better future for bilateral ties by taking the opportunity of jointly promoting the Belt and Road Initiative. 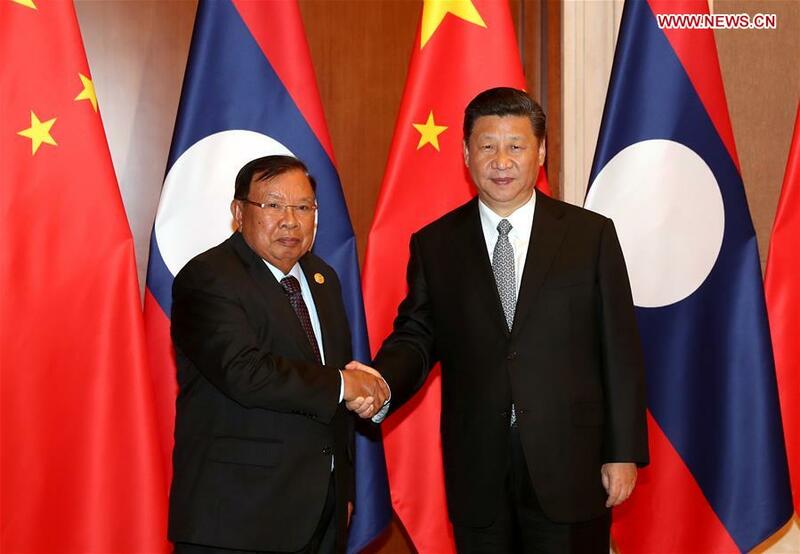 Xi, also general secretary of the Communist Party of China (CPC) Central Committee, made the remarks when meeting with Laotian President Bounnhang Vorachit, who is also general secretary of the Central Committee of the Lao People's Revolutionary Party (LPRP). The two countries constitute a community of shared future with strategic significance, Xi said, urging both sides to continue the positive direction of bilateral relations and ensure the long-term, healthy and stable development of their comprehensive strategic partnership of cooperation. The two parties and two countries should maintain frequent high-level communication, exchange views on major issues in bilateral ties in a timely manner and strengthen the top-level design of bilateral ties, Xi said, adding he is willing to maintain the tradition of annually meeting with Bounnhang. Xi called for deepening party-to-party cooperation, stressing mutual learning of party and state governance, so as to enhance ruling capacity together. He stressed the importance of advancing comprehensive cooperation, aligning development strategies, and strengthening coordination in international affairs to jointly safeguard China-ASEAN ties and regional peace and stability. Bounnhang applauded the fruitful results of the Belt and Road Forum for International Cooperation, saying it will significantly promote Asian connectivity and economic growth and bring more development opportunities to his country. Bounnhang said that leaders of the two parties should maintain close communication and strengthen exchanges on state governance experience, as well as personnel training. After the meeting, the two leaders witnessed the exchange of cooperation documents concerning economy, education and technology.